Gaynell Potter Simmons, 84, of Fairfield died Wednesday, November 28, 2018 at Vidant Inpatient Hospice, Greenville. Born May 25, 1934, she was the daughter of the late Seth Seymore Potter and Gaybell Marie Franks. She was married to Benjamin Cartwright Simmons, Sr., who preceded her in death. She attended the Fairfield United Methodist Church. 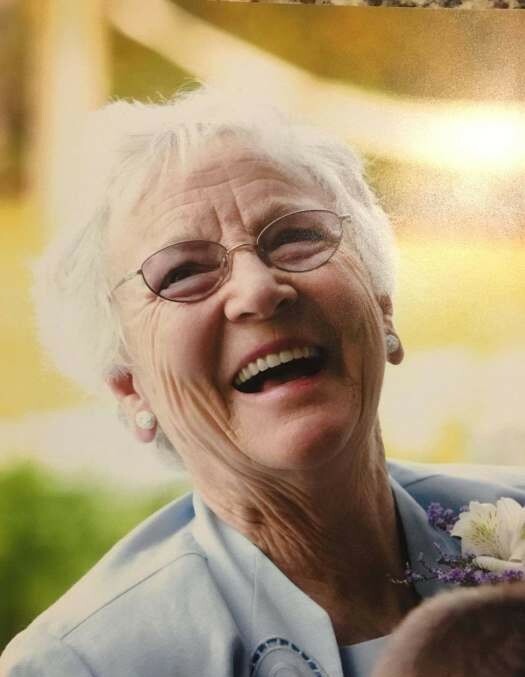 She was quick-witted and possessed a “funny-bone” that she loved to share with her grandchildren and great-grandchildren. She was conversational and a woman who was able to convey her thoughts and opinions skillfully and often. She possessed a great appreciation of God’s creation and enjoyed ring side seats on Lake Mattamuskeet with her beloved Ben where they never failed to realize the blessing of observing the annual migration of waterfowl. Year after year they watched the breathtaking views of the Canadian Geese lifting up from the water, ascending and then descending into the fall harvest fields. Back and forth the wild geese journeyed over the land and water that she held so dear, bringing her many hours of joyful, peaceful and contemplative reflection on the wonders of the Living God. Her love for reading allowed her to gain wisdom that exceeds learning. Affectionately known as “Old Granny” she was a mother to many beyond her children. Funeral services will be held at 10:30 a.m., Saturday, December 1, 2018 at the home place on 6124 Piney Woods Rd, Fairfield, NC. Burial will follow in the family plot in the Fairfield Cemetery. Surviving is a son: Benjamin “Jamin” C. Simmons, and wife, Pam of Fairfield; three daughters; Melony S. Carawan and husband, Phillip of Manteo, Mary S. Spencer and husband, Lamar of Fairfield, Kathy S. Ballance and husband, Murray of Engelhard; ten grandchildren; Jennifer O’Neal and husband, Brian, Tara C. Foreman and husband, Dennis, Marcus Ballance and wife, Heather, Becky S. Allen and husband, Josh, Benjamin Cartwright “Ben” Simmons, III and wife, Tonya, Julie C. Hodges and husband, Austin, Misty Spencer, Erin B. Anderson and husband, Mike, Charlie Carawan and wife, Danielle, Caroline B. Montgomery and husband, Mike; nineteen great grandchildren, Austin Spencer, Ainsleigh O’Neal, Andrew O’Neal, Benjamin C. Simmons, IV, Dylan Simmons, Nathanael Simmons, Olivia Simmons, Melony Grace Hodges, Bailey Gray Hodges, Hunter Drake Hodges, Spencer Allen, Evan Allen, Jon Allen, Maggie Rae Ballance, Carter Ballance, Brenna Anderson, Aubree Foreman, Mary Greyson McKiski and Wyatt McKiski, three sisters, Jean Ballance of Fairfield, Sandra Bryan of Springfield, Va., Sharon Spencer and husband Graham of Fairfield, a brother-in-law, Lowell Griffith and a gaggle of beloved nieces and nephews. In addition to her husband she was preceded in death by a grandson, Edward Neill Carawan; a great grandchild, Jude Carawan; a brother, Garnet Eric “Buddy” Potter and four sisters, Norma Caroline Ballance, Arlene Yvonne Griffith, Lorraine Marie Yates and Azalea Velere Mitchell. The family will receive friends at the home place on 6124 Piney Woods Road, Fairfield, Friday morning after 10:00 a.m.